Delicate and hushed tones of Anna Carter’s piano serve the opening notes to Moon Ate the Dark’s latest sonic journey –the mesmerising sophomore record, ‘Moon Ate the Dark II’ – whose fragile beauty radiates like the first rays of sunlight amidst the gradual dawn of day. ‘If Vanishing’ contains an entire spectrum of colours and textures as the piano transitions between playful, joyous melodic patterns to burning embers of hushed, resonant tones that drifts in the ether whilst the electronic treatment of gorgeous reverb (supplied by Bailey) evokes an ethereal sound world. The pop ambient gem ‘Little Girl Liquid’ is reminiscent of Germany’s Hauschka with its dream-like ambient flourishes and gorgeous flickers of hope and optimism. ‘Ventricles’ is an ambient tour-de-force. A myriad of sonic layers and subtle elements are masterfully woven together, creating in turn, a piece of music so utterly timeless and now. Gorgeous synthesizers and electronic treatments fuse with Carter’s heart-warming piano-led melodies. The dynamic is changed yet again on the following ‘Verse Porous Verse’ with euphoric piano-based melodic patterns that reaches new summits and sunlit horizons. The immediacy of Carter’s piano playing is indeed a joy to savor whose deft touch of hand graces each and every piano note. ‘Sleepy Viper’s gradual ebb and flow of strings and swirling electronics across the heavenly seven transcendent minutes conjures up the sprawling cinematic works of Deaf Center such is its epic scope and divine beauty. 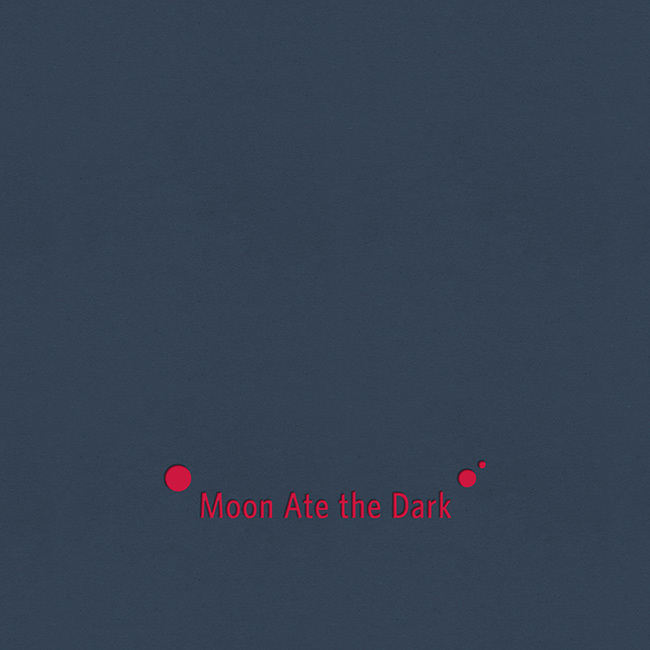 The closing soul-stirring piano melodies of ‘Lo’ and closing section of sublime drone soundscapes completes the highly remarkable achievement of Moon Ate the Dark’s latest master-work. ‘Moon Ate the Dark II’ is out now on Sonic Pieces. Interview with Moon Ate the Dark (Anna Rose Carter & Christopher Brett Bailey). Please discuss the making of the new self-titled record. I am very curious to learn more about this wonderful musical telepathy that exists between you both that shapes the intuitive quality to your stunning music. What were your primary concerns and aims for the new album that you felt was most important to find its way on the final recordings? Anna Carter: The first record we released was completely improvised and we didn’t have any set ideas at all before we started recording, so we wanted to try working in a completely different way. For this one we had planned structures and sections and we incorporated new sounds and instruments we hadn’t used before. Some of the tracks on the record are quite a few years old and ideas we had built on from various practices and improv sessions, we would mostly just sit and play together and if something interesting came out we would work on it. It’s often a very rewarding way to play as neither of us can tell what sounds are going to come out whilst trying something new and no matter how much we plan we can never recreate something exactly as before. Even if the general structure and notes are the same there will always be a new sound or even a whole section that is different. We may not always like it but there is always a surprise and it keeps the music alive, which is what I think we both strive for whilst playing together. One of the great hallmarks of Moon Ate the Dark is the innate ability to create mood and atmosphere through the art of sound. For example, the rich, dense textures of Chris’s production is masterfully inter-woven with Anna’s stunningly beautiful piano-based compositions. Please shed some light into this dichotomy of worlds for me? Also, please discuss the various production techniques utilized or sound treatments & manipulations? Christopher Bailey: Well, thanks very much! I rarely feel like a master, that’s for sure! I view my work in this project as the framing of what Anna does. Her distinctive voice as a piano player is the focal point of most of our music and my job is to extend and support, providing counterpoint where necessary. As with the first record, I am taking a live feed from the piano mics and manipulating them – echo, eq, reverb, pitch correction etc. – to create drones and soundscapes that support the piano and are built from the same source texture. The hope here is that the two things will fuse together, creating the illusion of an extended piano, rather than supporting the piano with a purely electronic palate that sounds inorganic by comparison. All of the technology I am using is cheapo guitar stuff you might see on the pedalboard of a shoegaze band…cause that’s sorta my background. I am not sure this combo is at all superior to the kind of processing that a macbook would afford, but that limitation helps to ground our music in a different sound world and lends it a rougher, more handmade feel… I guess. It also means that we are a nightmare live band and are constantly driving the mics into feedback by accident! Haha. ‘Ventricles’ is one of the album’s defining moments where a sense of oblivion awakens the listener. Layers of gorgeous sounds gradually fade into the foreground. Also, the aesthetic quality and rich dynamics is a joy to savor. Can you please talk me through the construction of ‘Ventricles’ and your memories of writing and recording? CB: Well I am sure glad you dig it! It’s the one Monique (sonic pieces) chose for the “lead track” and a lot of people are liking that one… but to be honest with you? It was a minor nightmare! Maybe we were spoiled on our first record – that the whole thing was an easy 2 day process – but this one song took longer than all our other tracks combined! We burned through multiple arrangements, edits and mix drafts. The basic piano sketch had been captured late in the day on the last day of recording (when inspiration often seems to strike!) and the rest of it was assembled at the mix stage one small chunk at a time. It was the longest, most arduous assembly job of any of our tracks and we we’re arguing about it even after the album had gone for mastering. As I say, this album was our first attempt at multi-track recording and I think that change is most noticeable on this track – the electronics and piano parts are quite evidently separate, and many of the layers in the sound were added months after the initial recording. We strongly felt it needed greater structure and feared the composition was missing a section, but without any more money to hire studio time we had to rely on production tricks to give it a more definite shape. The middle section is carved out by pulling back to the room mics before introducing the bass synth and an ending was found by manufacturing an artificial reverb swell before gluing the outro refrain on. To a lot of musicians this kind of frankenstein surgery is par for the course – maybe even the preferred method! But for two technophobes like us, it’s better to get a clean cut of the track start to finish if we can! What was the studio set-up for the recording sessions? I wonder how long were these particular recording sessions and were any new processes or techniques utilized this time around? I am curious whether improvisations served the foundation to any of the album’s tracks? AC: We had three days altogether in a studio in Bristol with our friend Joe Garcia as our engineer. We had a piano, a mini brute synth, a violin, Chris’ pedals, we had a Cellist come in and play some parts we had written and we also used my voice. The use of the mini brute wasn’t planned but Joe brought it in for us and we loved the sound so much we had to use it, so although no improvisations appear on this album a couple of the tracks were actually written in the studio as we felt inspired by the new sound palette. The first record was recorded in an old warehouse with a really simple setup, no desk or fancy live room, so this time we did feel slightly out of our depth. However it was exciting to be able to multi-track and hear our ideas come to life whilst each new layer was being added. I would love to gain an insight into your fascination with sound and its origins? What are your earliest musical memories and how soon did you realize that the duo (aptly named Moon Ate the Dark) would be born? AC: I remember as a child watching The Secret Garden video tape over and over just to hear the music by Zbigniew Preisner, after a while it became really warped and started to sound more like a horror movie score! I also remember asking my Dad for a Backstreet Boys CD when I was ten but he accidentally got me a Beastie Boys CD which I loved and listened to all the time. I’m thinking now that he probably did it on purpose! But it was only when I got an old upright piano for my 13th birthday that I felt inspired to play and write. CB: My earliest memory of music was riding shotgun in my Dad’s car, 1992 or 93. The song ‘Foxy Lady’ by a very obscure and credible underground band you probably aren’t aware of called Jimi Hendrix came on the radio and it seemed to crawl out of the speakers. I wasn’t as much taken with the song, as I was the burst of feedback before the song begins… Based on that sole fascination alone I pestered my parents for a plywood Les Paul copy and a Peavey starter amp (with both distortion AND reverb!). As a teenager I amassed a small collection of pedals and noise boxes as a shortcut to sounding good without technique and would record hours of white noise and found sounds – anything from bacon frying to the family cat – on a Tascam cassette recorder around the house… and the Tascam cassette recorder is still the most complicated mixing console I am confident using! Chris and I met at a music college in East London in 2008/09. I was playing the piano one day and Chris came in to the room, shut the door and started fiddling around with cables, mics and amps around me. I didn’t really know who he was at this point so I just carried on playing. Then after a few minutes this sound started filling the room that was magical, soothing and terrifying all at the same time, and that was the birth of Moon Ate the Dark. 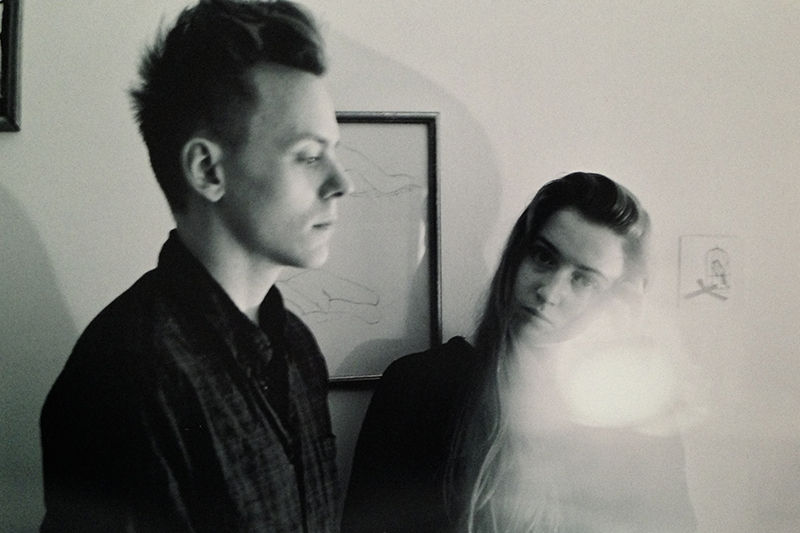 ‘Sleepy Vipers’ is such a tour-de-force in the divine neo-classical and ambient realm. The sequencing of the record works so well and the final section – ‘Sleepy Viper’s gradual ebb and flow of strings across the heavenly seven transcendent minutes and the closing deeply poignant piano melodies of ‘Lo’ – represents the album’s most compelling and affecting moments. Discuss please the flow to the record and particularly a composition such as ‘lo’ which feels the perfect (and fitting) close? CB: Back in 2012 Anna and I would alternate whose house we rehearsed at. With us both being the type to turn up 40 minutes late with no good excuse and the journey across London being at least an hour each way, this seemed only fair. The trouble was that my house doesn’t have a piano, so we embraced the challenge and starting building loops and soundscapes with a £20 violin as the source. Our favourite of those experiments provided most of the collage that begins “Sleepy Vipers”, but feeling it wasn’t enough on it’s own Anna worked with her friend Carys to create the awesome cello progression that provides the second half of the track. I’m very pleased with how this piece came out and along with “Verse Porous Verse” it’s my favourite of any music we’ve made yet. “Lo” dates back to about the time of our first record and was our first composition, as opposed to improv piece. It was also our live opener at most gigs 2012 – 13, because the drone at the beginning could be faded in real slow to bulk out our set time if needed, and because it was a good way of introducing our 2 instruments as separate elements. Because of this I had always imagined it as the opening track on the record. But compared with a lot of the other material we ended up recording it seemed a claustrophobic listen. It also seems closer to the emotional register of the first album, for me. So by placing it last I kind of hope it’d bring the listener full circle, back to world of album number one. Having said that… when I got the test pressing through the post from Germany I put the needle down on the wrong side and ended up listening to side 2 first. And I have to admit… I think that track sequence works at least as good as the one we went for! Seriously, try listening to side B and then side A and see if you don’t agree? Please discuss your love of film music and your particular favourites? Which films served significant inspiration for you both? CB: Okay… so… at this point we have a little admission to make. Although on our press releases it has said since the beginning that we were “drawn together by an interest in film music” it isn’t really true. Or rather it isn’t literally true. Neither one of us has ever had a particular interest in film scores, above any other kind of music. Before we had the support of Sonic Pieces we would sometimes struggle to explain to people what our music was like and saying “a bit like something in a film” seemed an economic (albeit lazy) way of saying “instrumental, not jazz, classical but not Classical, emotional but not overly melodic, focused on mood” etc. etc. etc. Since that time a number of artists doing music in neighbouring styles have had some crossover success, so it’s now a lot easier to explain! And perhaps as a parallel the genre of film music seems less homogenous than it once did… or maybe I am seeing different kinds of movies. This might also be a fortuitous chance to plug our pal Joe’s new record. He is the engineer who worked hard with us on both albums, and a great musician in his own right, albeit in a completely different sound world. Last time I visited him he was telling me about how his band ANTA were working with composer Anton Maiof to produce a soundtrack album to the infamous DUNE adaptation that Jodorowsky never finished. He didn’t spill the release details but some googling should do it!